Well, sort of - "Tooth and Claw", obviously, is meant to be set there but was filmed entirely in Wales. While "Horror of Fang Rock" seems to be English (and was filmed in Birmingham, so about as far from an actual lighthouse as you could get), but the event that it's patterned after took place on the Scottish Flannan Isles. 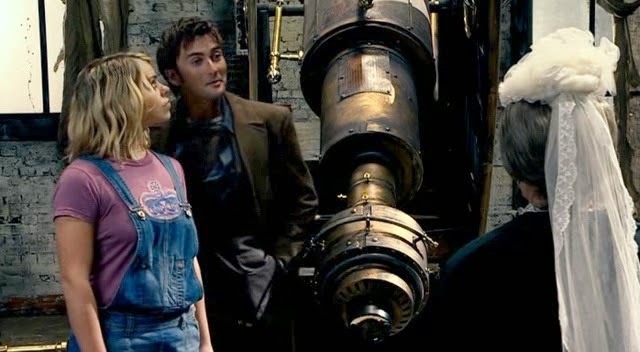 Throw in David Tennant's turn as Scottish-faking-English-faking-Scottish and the lightkeepers' ever-so-slightly-comedic accents, and it's all a mite muddled. Dicks was a good deal more subtle about his Edwardian-era trappings than Davies' ostentatiously Victorian Victoriana, mind. The monster's pretty much the same, too - shapeshifting lycanthropic monster who's come down like a flaming meteor and has to be fought off with diamonds and a bright light source. The companions get to be hilariously out of time (though it's nice character development that Leela's learned a few things about Earth culture since her last story, whereas Rose seems to be trying to be more anachronistic the longer she hangs around with the Doctor). Official musical video, as per the opening. 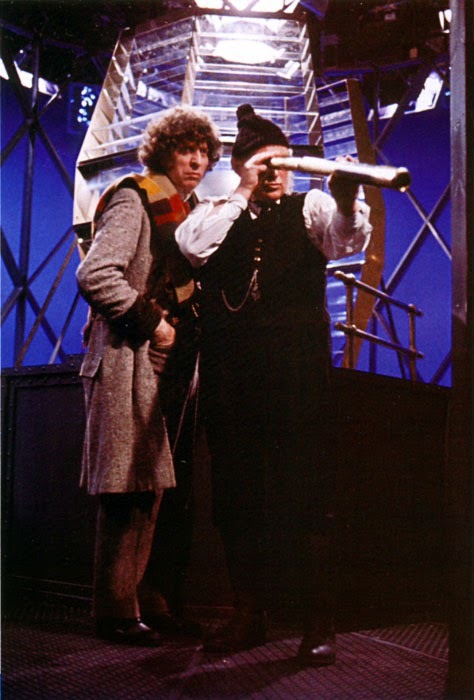 The Doctor is, of course, perfectly right that the Ian Dury and the Blockheads single made it to Number One in 1979, but it didn't come out in 1979 - in fact, it came out 23 November 1978 (one wonders whether this bit of trivia was in anyone's mind during production). The band's single from 1979 was the endearing "Reasons To Be Cheerful, Part 3". Although, neither of those are live - and there's no such thing as too much Madness - so have another clip of "Drip Fed Fred". "More than you ever wanted to know about mistletoe"
Starts off from first principles - what's a parasite? but after twenty minutes it finally gets to the point with several odd anecdotes about its place in historical legend. It's a very interesting, very toxic plant and lining your library with it really would be contraindicated, you'd think. A short, sweet summary by an Indian news service. There were a lot of clips about it in Hindi, unsurprisingly. They'd still like it returned, even in its cut-down form, but the UK government had consistently refused to do so (see also: Elgin Marbles, quite a lot of the British Museum). David Cameron has mouthed off to that effect recently, but not interestingly enough to link here. Not the greatest audio in the world, but if you want to know about the botanical family of Torchwood trees (yes, they're real), this is about as good as it gets. Citruses, so they have nice orangey fruits that are apparently quite edible. "Planned kidnap plot at Balmoral"
Davies' storytelling instincts are quite good sometimes; apparently some Irish nationalists took it into their heads to try kidnapping Queen Victoria while she was on holiday in Scotland. The date's rather earlier - 1867 - but that'd still have been early enough for Victoria-in-mourning-about-Albert and the diamond, and indeed couldn't have hurt the running-up-and-down corridors aspect of the action. So at the end of the story, the Doctor quotes a poem that may or may not have been inspired by the events he's just witnessed, but which certainly inspired Terrance Dicks when penning the story. Wilfrid Gibson wrote quite a lot else (he was one of the Great War poets), but this probably is his most famous. Text here, summary here, unexpectedly fab folk song I stumbled across here. First part of an affectionate BBC send-off to the Birmingham studio, though sadly they didn't think to rope in anyone from Doctor Who to talk about how different it was filming away from London for a change, or even ask Peter Davison in to chat about "All Creatures Great and Small". Quite a bit more where that came from on BBC Local Birmingham, if you're interested. The bit they don't mention about the cancellation of Pebble Mill at One was that it was Michael Grade's clever idea. Again. Heigh-ho. The obvious comparison, as the biggest, fanciest, most exciting lighthouse of antiquity. A Tom Baker story set then would have been brilliant. Skinsale showing off about how well he knows Bonar Law seems a little anachronistic, if we are meant to think it's the turn of the century - he'd only just been elected Conservative PM in 1900 (though the story can't even take place the same year as the original, what with the mention of King Edward). It's certainly not set when Law became Prime Minister, as that wasn't till the '20s...and the arrival of motion pictures. It's one thing for the Rutans to appear only once in the classic series, but one would rather expect Strax to have run into a Rutan by now, the amount of screen time he's had. Not so, not even in one of those random shorts. The UK Gold trailer, to preserve the suspense, doesn't even show a glimpse of the monster. Ditto the fan trailers. The Horror of Fang Rock special feature trailer, naturally, goes off in a completely different direction about Terrance Dicks script-editing the show (fun, though). And the BBC episode guide clips stopped working years ago. Rutans were in "The Gunpowder Plot" game, but predictably, the preview clips don't show them either. So, you know, enjoy the elusive green blob in all its memorable two-dimensional blobbiness. Or just go watch the story. It really is entertaining, with Dicks adding little historical snippets every few minutes, a villainous B-plot that has nothing at all to do with the monster, and Louise Jameson getting some of her best moments.